Imagine you are at a party. The music is loud and lots of people are talking. How can you hear your voice and those of other people? Similarly, bats face this problem when in groups. When a single bat uses echolocation, it emits an ultrasonic call (above 20 kHz) and extracts environmental information by analyzing echoes. 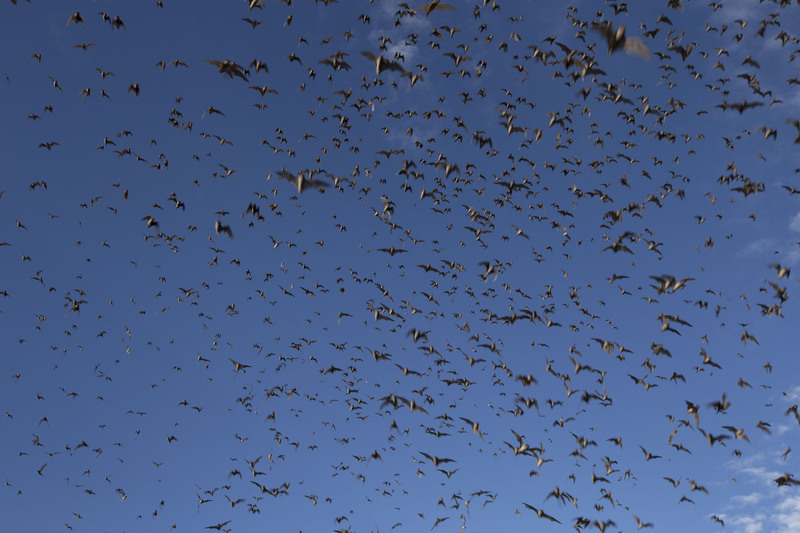 But for bats that live and travel in large groups, echolocation should be challenging. Under these circumstances, they should encounter the problem of sonar jamming, where they might have a hard time distinguishing their echoes from other bats’ and their own calls. One bat species that is known for extreme grouping is the Brazilian free-tailed bat, Tadarida brasiliensis. Figure 1: Brazilian free-tailed bat (Tadarida brasiliensis) emergence, which usually occurs from 16:00 to 20:00, last about 15 minutes. These bats can quickly change characteristics of their calls when probing different environments and performing different tasks. These call characteristics include duration, repetition rate, and frequency (or pitch). The shape of a call, how the call changes frequency over time, may provide important echo information to the bat. 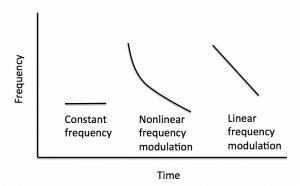 Brazilian free-tailed bats can change the call shape from a straight line (constant frequency) to a downward curved line (nonlinear frequency modulation) and finally an inclined line (linear frequency modulation) within milliseconds (Fig. 2). Additionally, the bats can emit different frequency components at the same time. The call shape variation of bats flying in a group might help us to understand how they avoid sonar jamming. Figure 2: Typical call shapes of Brazilian free-tailed bat (Tadarida brasiliensis). In order to investigate how these bats change calls while flying in groups, we developed a new method to identify the shape of a bat call and quantitatively compare different call shapes. This method separates the multiple frequency components of bat calls (called harmonics) and tracks the trend of frequency over time using advanced digital signal processing techniques (Fig. 3). Once these trends are extracted, call shapes can be quantitatively compared through point-to-point comparison by aligning different call durations. 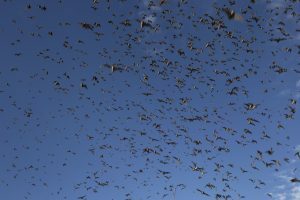 This method is the first important step to understanding how bats avoid sonar jamming while in large groups. We hypothesize that some call shapes are more robust to distinguish than others when in a chaotic sound environment. Figure 3: Typical procedures for the isolation and tracking the first frequency component of the Brazilian free-tailed bat echolocation call. (a) Original echolocation call; (b) low frequency noise free call; (c) noise among different frequency components was removed; (d) isolated clean first frequency component; (e) call shape was extracted, black solid line superimposed on the isolated frequency component.